A few of those questions that we come across more than often! In case you have any further questions regarding our policies and the overall shopping experience, we are always happy to assist you by phone, live chat, or email. Why should I shop at DiamondWish.com? As 3rd generation diamond experts, our industry experience allows us to provide our customers with the finest quality diamond jewelry with exceptional customer service. 100% satisfied customers is our goal and is the reason every purchase includes risk-free 30 Day returns or exchanges. Because we are the manufacturer and the retailer there are no 3rd party markups and we are able to offer our customers exceptional values. Every purchase includes a free warranty and lifetime upgrades. We take pride in what we do and we stand behind your purchase. For more information about us, please visit Our Story page. Do you offer a free lifetime warranty? Yes! A free lifetime limited warranty is included with every purchase. Fine jewelry should last for a lifetime and we help ensure that through proper care and maintenance. Shipping and handling fees may apply. For more information on free included services visit Our Promise page. What are the requirements to upgrade my jewelry? There are 0 minimums, time requirements, maximums and our upgrade / trade-in policy covers anything ever bought from us. Your jewelry is always value at 100% of what you originally paid and valid towards any other product of any greater value. See Our Lifetime Information page for details. We are located in Los Angeles, California. All our jewelry is hand-crafted in the USA by our family of jewelry experts. Can I request a diamond certificate before I buy? Yes. Because we provide diamonds from the inventory of DiamondWish only, we can provide these upon request. Simply email us at info@DiamondWish.com with the diamond information you are looking for, including the item ID # and we can provide diamond images, certifications or videos. Can I order just the ring mounting without the center diamond? Yes. When designing your own ring you can start with the setting and once selected, under step 1 there will be an option to purchase the ring setting only. Are your Diamonds Genuine and Natural? Yes. 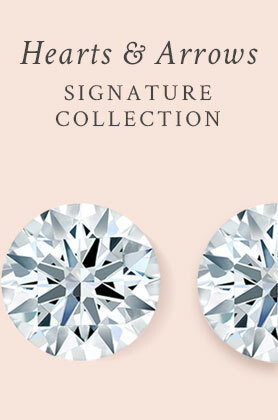 All our diamonds are certified and genuine. With over 40 years in diamonds and jewelry crafting, we strive to provide our customers with the best diamonds in the quality of their selection. Yes - We use 3rd party certifications including GSL, EGL USA and GIA grading reports. You can view what certification that is included with your item by reading the title of that product. We can also provide a specific certification by emailing us the item number and the particular grading report your desire. Yes, 100% conflict-free. All our diamonds are genuine, natural and ethically sourced. Which clarity numbers and grading is the best? For Color Gradings the most absence of color and highest rated starts at D and continues down the alphabet gaining more visible color. For Clarity ratings VVS or Very Slightly included are among the best going down the scale to I or Included. Showing the most visible inclusions to the naked eye. With most diamond shapes we may recommend a clarity rating of SI1 or Slightly Included level 1. This will show minimal of natures flaws and allow for a brilliant light performance. For more diamond education visit our Diamond Guide Page. The best color grade available is D. Though, if you are a savvy shopper looking for a great value G-H in color is our most common purchased color grade. What is the quality of your moissanite gemstone? Because we manufacture and control the quality of our Lasting Brilliant Moissanite it's quality rates as Near Colorless (G - H diamond equivalent color) and Eye-Clean (VS1-2 diamond equivalent clarity). Genuine Moissanite gemstones are of the rarest minerals found in nature derived from meteors. With 3 generations experience in fine jewelry, we create our Moissanite gemstones with the highest quality standards. These gems surpass any other for brilliance and will only be surpassed by the diamond in hardness. For these reasons, the moissanite is a high quality gemstone that will endure generations yet remains an exceptional value. Do you provide an appraisal report for insurance purposes? Yes. This is provided upon request free of charge. When you place your order please check the box for free appraisal report and one will be included for you. What does diamond fluorescence mean? What is a good fluorescence rating? Florescence actually is the absence of a blue color tone in diamonds. None would be the best grading available for Florescence. Though, faint to medium is difficult for a skilled eye to view and these ratings may provide a better value. What is Ideal Cut? Do you sell Ideal Cut diamonds? We offer our Signature Hearts and Arrows Diamond that is cut to ideal proportions and standards. This is known as the hearts and arrows cut because these proportioned shapes are visible under a microscope. Diamonds with higher cut grades will perform better with light refraction and appear brighter exuding more sparkle and fire. Do you sell engagement ring and wedding band sets? 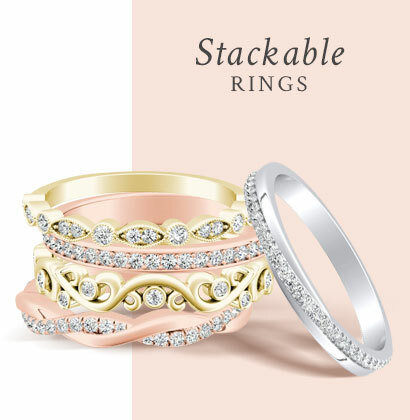 Yes - At DiamondWish we offer single bands, engagement rings, or wedding ring sets. If you still can't find what you are looking for contact us and we can assist. What earring backings should I select? Most common backings are the push backs due to their ease and simplicity for quick on-and-off wear. Though the screw backs are suggested due to their security in wear. While these backings take a few seconds to place and remove, they result in less lost and missing earrings or backings during wear. Yes! We specialize in unique and special request orders from larger center diamonds to an uncommon gemstone. Please Contact Us and one of our diamond experts can assist in your customization. What metal type do you recommend? While 14KT White Gold is the most popular 14KT Rose Gold is trending as a modern option for many earring and ring settings. We offer 18KT which is more pure than 14KT. Platinum is a white metal with the highest purity and is considered to be hypoallergenic and recommended for anyone with a nickel allergy. What size is a 5MM Diamond? A 5MM round diamond is generally about a 1/2 or .50 carat diamond. 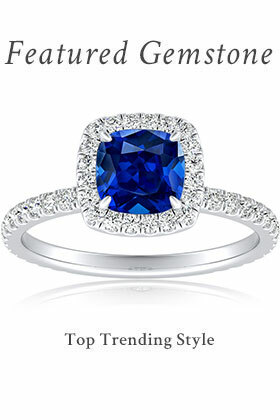 Do you offer gemstone engagement rings? Yes! 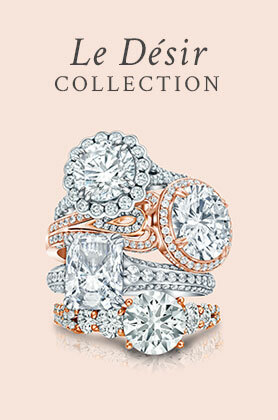 While we specialize in diamond jewelry, engagement rings are our true wish. Because of this we are able to offer great values in an array of stones from Sapphire Engagement Rings to Morganite Rings and Aquamarine Rings all featuring gemstone centers. Find your ring size before your purchase to ensure the accurate size is ordered. What if the ring I ordered doesn’t fit and I need a different ring size? With the included lifetime warranty we require the ring to be sent back to us for sizing. The first ring re-sizing is a free courtesy. This will ensure your ring is cared for by the same expert hands who originally crafted it. Some rings are not able to be sized, in these cases we may replace the ring with a new one. Do you sell more than Diamond Engagement Rings? Yes! 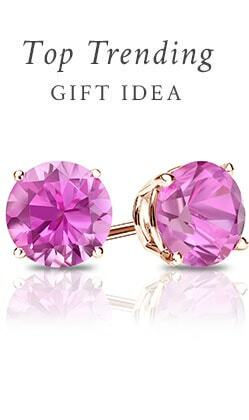 We sell any specialty and giftable fine jewelry ranging from black diamond stud earrings, certified diamond pendants, diamond bracelets, to gemstone earrings. What is a moissanite ring? With our wide array of center stone options, moissanite rings feature the sparkling created gemstone center set in a ring setting accented with side stones of natural diamonds. 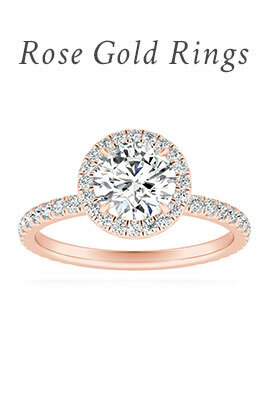 The moissanite stone is a gem that sparkles with more fire than the diamond and is the next closest gem in hardness. Making moissanite engagement rings sought after for their value and sparkling life-long wear. The most simple and safe recommended care for your fine jewelry is a 20 to 30 minute dish soap and water bath. Then a soft tooth brush cleaning before a pat dry with a soft cloth. Never use harsh chemicals to clean jewelry. Avoid ultra-sonic machines that vibrate and heat for fine settings like a micro-pave fashion diamond rings. We accept most popular forms of payment including for all major credit cards – Debit, Visa, MasterCard, American Express, and Discover. We also accept payments by PayPal, PayPal Credit and BitCoin. Wire Transfer is available for international orders or by special request. Financing is also available for easy monthly payments of your purchase. Yes, our layaway is simple and allows you to select your item today to ensure in-stock and pricing you see today with allowing up to 6 months to pay. Shipments are made upon final payment. See our Layaway Page for more details or Make a Payment now. Can I make changes or update my order? Yes. We can accommodate changes to an existing order given notice before it ships. Contact Us as soon as possible, ideally before your order ships to ensure there are no delays. Yes. We currently offer Financing through Affirm so you can take the stress out of your purchase and allow simple payments to be made overtime. How do I request the free appraisal? Yes. Simply click the box under the price listed on your item page before purchasing. Then one will be provided for you. Availability will vary by product types. An adult signature is required to ensure your insured jewelry arrives to you safely of packages $350 valued and above. Can my order ship to a different address? Yes, we can do this! If your order value is more than $350, please add the shipping address as an alternative address on your credit card. For more information, please read our Shipping Policy page. Can you ship to APO and FPO addresses? Yes, we offer free delivery to US military addresses. Orders sent to APO and FPO addresses are sent via USPS Express Mail or Registered Mail. Orders ship within the provided date on the product page where the delivery truck icon is shown. Then the delivery date is based upon the individual processing center for the final step of delivering the package. What if I cannot be home to sign for the package? Please contact us before your order ships. We can have the package shipped to the nearest FedEx or UPS center where your package will safely be held until you are to pick it up at that facility. What if I need the order faster than the estimated ship or delivery time onsite? At times we can make accommodations to rush delivery of an order so you can receive it quickly! Need that perfect sparkling gift quickly or have that anniversary that came up quicker than you imagined? We can assist. Call, Email or Live Chat, and we can look into available options to make your DiamondWish come true. On the item product page look for the shipping truck, this will show you the soonest shipping date available for that product. This is usually within 3 to 5 business days. To check the first available delivery date add the item to cart and on the billing page will show available shipping options including expedited shipping. This will give you an accurate delivery date for each item. What if I didn't receive any order updates? Will my order ship on time? Yes. From time to time order status emails may not be received until the order has shipped which provides the tracking number. At any time you may track your order here. How do I check my order status/track my order? Simply Check Order Status here. If you have any troubles logging in please email us at info@DiamondWish.com and we can email you an update on your order. Please note even though we may be processing your custom order there may not be available updates showing in My Account. How do I take advantage of the lifetime upgrade program? At DiamondWish.com we offer a 100% upgrade credit equal to the amount you originally paid at anytime an all jewelry. There are no limits to your upgrades. For more details on upgrading an order visit our Lifetime Upgrade Page and email us once you have selected a new item to upgrade. Do your moissanite engagement rings qualify for the lifetime upgrade program? Yes. Because we guarantee the quality of all our fine jewelry, all Moissanite jewelry qualifies for the lifetime upgrade program at 100% of the original paid value towards a new purchase of any greater value. What if I don't have my original order number to upgrade? No worries, simply email or Contact Us and we can provide the original order number to you. Yes. We most commonly ship internationally to Canada, Australia, New Zealand but ship to all the below countries. There is shipping charges for international shipments or returned shipments. For additional details please visit our shipping policy page. How do I get a solitaire ring resized? Simply email us at info@DiamondWish.com. We will inspect, verify your ring and resize the ring in house by our master jewelers. A return shipping label may be provided for you. We offer free returns and exchanges within 30 days of the original delivery date. We always want our customers to be 100% happy with their purchases and stand behind the quality of every purchase. For more details please visit our Free Returns Policy page. Within 30 days of receipt of your order, please send us an email anytime to info@DiamondWish.com for a return or an exchange shipping label.